Ask anyone who knows me and they will tell you that I tend to go a bit overboard when it comes to party planning. I just want everyone to feel like I thought of them and that they feel special. To me, it is the little things that make a big difference. This could entail serving a special drink someone likes, personalized water bottles or juice boxes, decorated serving tables, or specialized candies. But this 4th of July I am going to do a simple party especially since it will be so hot. 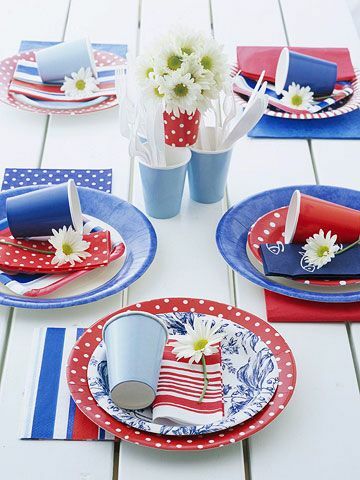 I began by going thru my long party prep list and started pairing it down to create these easy to follow 4th of July party ideas. Food – With it being warm I like to serve easy dishes and no sweets. Keep anything that will spoil on ice. Entertainment – We live on a lake so our entertainment is pretty simple. But I do have to plan for those not wanting to go in the water. Refreshments – It is important to keep everyone hydrated! Please practice safety when using or around fireworks. Whether you are hosting a big or small party, keep it simple. Have everything in place before guests arrive so you can enjoy the party too. Enjoy and be safe as you celebrate the independence of the good old USA. Click here to download this easy to follow party planning list.